While hundreds of Lebanon – Wilson County, Tennessee homeowners know and love Bentley’s Air Conditioning, many are unaware that we also do commercial heating and cooling. 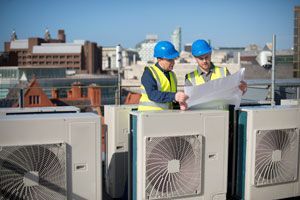 Equipment Replacement and Retrofit: From tenant improvements to complete unit upgrades for your business or property, Bentley’s provides the best value on Trane comfort systems – the most reliable equipment in the industry. Design/Build: Drawing on many years of project management experience, we can plan and install the perfect heating and air conditioning system for your new building’s long-term comfort and efficiency. Preventative Maintenance: Our maintenance agreements for businesses of every size ensure that equipment operates at the highest efficiency and performance, reducing monthly and long-term costs. Complete System Installation: We excel at perfecting every detail that impacts your comfort. Bentley’s experts will meticulously assess your business or building and make recommendations that fit your exact situation and budget. Duct Work: Our mechanical engineers will design the ideal duct configuration for your building. Bentley’s Air Conditioning has a long history of meeting the unique cooling and heating demands of Lebanon – Wilson County, Tennessee. Fielding the top team of technicians in the area, we address challenges resourcefully, stay on schedule and within budget, and provide ongoing support and maintenance. Thorough. Trustworthy. Business-minded. Count on Bentley’s to provide commercial air conditioning and heating solutions that add value to every dollar.